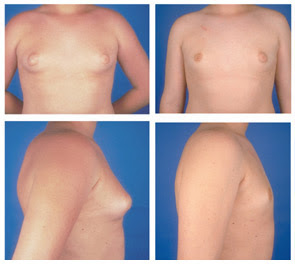 Klinefelter's syndrome was first described in 1942 when Klinefelter et al studied 9 men with gynecomastia, small testes, azoospermia, and elevated levels of gonadotropins. They believe that hypogonadism is derived from Sertoli cell failure, of the testis, as a place of spermatogenesis. Pubic hair distribution and the corresponding axillar an indication of relatively normal function of Leydig cells that produce testosterone. They also say that these patients had a testicular hormone levels are low or sometimes nothing is regulated by pituitary gonadotropin levels through feedback inhibition. They named this hormone by hormone X, or inhibin. Klinefelter syndrome is the most common chromosomal disorder associated with male hypogonadism and infertility. It is defined classically by a 47,XXY karyotype with variants that demonstrate additional X and Y chromosomes. Klinefelter syndrome affects 1 in 500 to 1,000 newborn males. Most variants of Klinefelter syndrome are much rarer, occurring in 1 in 50,000 or fewer newborns. Older children and adults with Klinefelter syndrome tend to be taller than their peers. Compared with unaffected men, adults with Klinefelter syndrome have an increased risk of developing breast cancer and a chronic inflammatory disease called systemic lupus erythematosus. Their chance of developing these disorders is similar to that of women in the general population. Children with Klinefelter syndrome may have learning disabilities and delayed speech and language development. They tend to be quiet, sensitive, and unassertive, but personality characteristics vary among affected individuals. Researchers suspect that Klinefelter syndrome is under-diagnosed because the condition may not be identified in people with mild signs and symptoms. Additionally, the features of the condition vary and overlap significantly with those of other conditions. Most men with this syndrome are not able to get a woman pregnant. However, an infertility specialist may be able to help. A special doctor called an endocrinologist may also be helpful.